FWwhen filling our the actual form - there should be a drop down box everytime the person click a box. Only SOME show up (no on my end but on THEIR end as they fill it out). 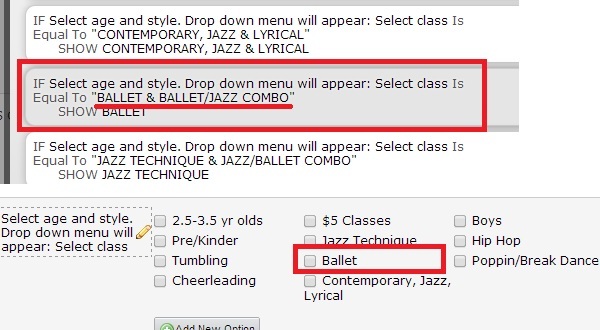 If you try to fill out form here http://www.blissacademydance.com/registration/ - you will see that under step 2, recreatin teams you will see that when you click on some - like TUMBLING it give you a drop down box to choose actual class. If you click on others, like BALLET you ge tno drop down box. The drop down boxes are all showing in jot form. And even on the part I recieve in my email. But not on teh website for the user to actually choose from. Looks like there are conflicts on your Conditional Logic. This explains why some won't work. Your condition for the Ballet checkbox which points to a missing option. If you notice, Ballet & Ballet/Jazz Combo is not listed and therefore should be set to Ballet. Kindly check all your conditional statement and make sure they are all configured correctly. GOT IT FIXED. Thanks soooo much!